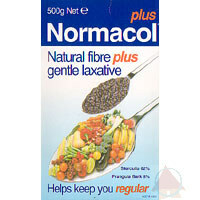 Normacol Plus is a natural fibre supplement plus a gentle laxative to help keep you regular. Nomacol Plus granules are designed to provide bulk in the bowel where it's needed and not in the stomach. This avoids the feeling of fullness or bloating, which can occur with some gel-forming products. Normacol Plus will not produce flatulence and 'wind' commonly associated with other types of fibre. Nomacol Plus granules contain 'sterculia', a natural fibre product and 'frangula', a natural gentle laxative. Sterculia is a vegetable gum obtained from the karaya tree. Frangula is a traditional herbal laxative. Together these two ingredients act by providing dietary fibre and additional laxative effect to bring natural relief from constipation. Directions for use: 1. Place dry granules in your mouth, in small quantities if necessary. 2. Swallow granules immediately with plenty of water or a cool drink, without chewing. Dosage: 1-2 heaped teaspoonfuls taken once or twice daily after meals or as directed by the doctor. Reduced dosage may be given to children (6-12 yr) as directed by the doctor. If you do not have a bowel movement after taking the granules for 4 days, you should stop the treatment.